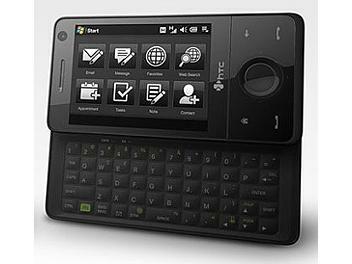 The HTC Touch Pro(tm) brings together elegant touch screen response with the direct precision of keyboard entry... leaving out nothing to deliver a powerhouse communication tool in a beautiful, compact design. HTC's rich, touch-responsive interface, TouchFLO(tm) 3D, provides a stunningly intuitive way to zip through common tasks like messaging, calendar checks or making calls. Delve a little deeper to find that playing media files, searching for contacts and surfing the web are also responsive to your touch. The web browser puts the full Internet in the palm of your hand. Websites look just like they do on a PC, and TouchFLO(tm) 3D makes it easy to pan around and zoom in on exactly the information you're looking for. If you need a wide screen, simply tilt the Touch Pro sideways and the page switches to landscape view. Slide out the 5-row QWERTY keyboard to make light work of typing-intensive tasks like composing email or working on Microsoft Office(R) documents... perfect for when your day takes a serious turn. Built-in Wi-Fi and TV-out functionality* mean you can hook up to the local wireless hot spot to surf, then deliver the perfect PowerPoint(R) presentation without a laptop in sight. Mobile Internet features - surf and download at broadband speed with HSPA and Wi-Fi(R). Vibrant TouchFLO(tm) 3D user interface. 3.2 megapixel auto-focus camera with flash light for quality stills and video. microSD(tm) slot for expandable storage. Integrated GPS can be used with maps software for a full turn-by-turn navigation experience. *HTC TV-out cable is needed.